Hand Embroidery Always. Love to Stitch.Gotta Stitch. found at the op-shop followed me home. The ladies in the Tv series The Borgias wore Snoods quite often. How on earth did they get them to stay on before hairclips were invented? I thought they looked lovely over beautiful long hair, and they also lend themselves to some beading embellishing. Sooooooooooooo, for those knitters out there. 1 yd of 1in wide ribbon. half yard of narrow elastic. The pattern calls for something called glove cord. Ok..Using no6 hook, make 39 chain. 2 tr. into 5th chain from hook*1 ch., miss 2 ch of foundation,2 tr into next ch. Rep from * to end.12 groups. Turn with 4 chain. 2 tr. 1 ch.into each space to end of the row.ending with 2tr.into space of 4ch. turn with 4 chain. repeat 2nd row 16 times. 18 rows in all. fasten off and darn in ends. Thread elastic through back part of snood ie. along foundation chain edge and about 4" up each side. cut ribbon in half and thrad round remaining edges, ending each piece in centre of last row. Join ribbon and elastic firmly together and tie ribbon in a bow at centre front. same elastic and ribbon as crochet version. Using #6 needles cast on 36sts very loosely. K 1 row then continue in following drop-st pattern. K 1. then winding wool twice instead of once round needle for each stitch. k to last st.k last stitch in usual way. Rep last 2 rows 13 times. Finish is the same as for the crochet version. 40's to 50's style of dressing.And of course the 16th century Italian style. 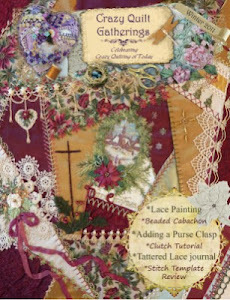 Shabby-chic collage with embroidery along with Crazy Quilting. A shabby-chic, crazy quilting lover of stitching, hoarder of beads and vintage laces n fabrics. Bird n Bunny Panel is Done! https://www.facebook.com/stitchingalways. Watermark theme. Powered by Blogger.